DataBoy is a domain name registrar. Our rates are competitive in the marketplace, starting at $15.95 for a .com name. All domain names on the Web are registered through registrars to the Internet Corporation for Assigned Names and Numbers, known as ICANN. One reason our clients like us to handle their registration is that they know they are protected, as we have a personal interest in your business. We will handle any necessary issues or you, such as keeping your registration information current and protecting that information. Should you forget to pay your annual registration fees on time, we will make sure your domain is renewed, avoiding the possibility of your Web site going offline. If you are registering a new domain, and you are a DataBoy client, we will work with you to find a name that will be good for your business or organization. This is often a very time-consuming task. Domain names have become a vast frontier for speculators, so even if someone has not already registered the name you want, chances are good someone else has, in the hope of reselling the name at what is often a hefty price tag. 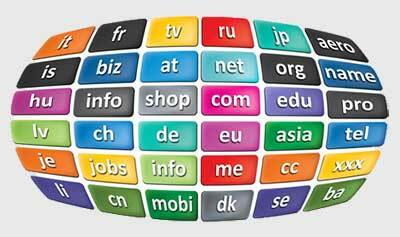 Below is an article with some good advice to consider when choosing a domain name. Hundreds of thousands of domain names are registered daily, and the phrase is often heard that "all the good names are taken". The coveted dot-com TLD (extension) is all used up, they say. When you search the domain registry looking for a dot-com name for your company, it is easy to believe that this is true. I know. I do a lot of it - both for myself and my clients. ICANN, the non-profit organization that oversees this whole domain name thing, came up with several other extensions to relieve the problem. Besides ".com", there are now a multitude of TLD's. But .com is still the ruler. The reason for .com's popularity is not exactly rocket science. It was the first domain name extension to be used commercially, and still, by far, dominates the web in usage. Your domain name ending in .com (as apposed to .biz or .something-else) indicates that your business has been around for awhile and is well-established. In addition, most browsers search for a dot-com name first. For instance, if you type DataBoySoftware into your web browser's address bar, the first thing it will do is look for DataBoySoftware.com - not .biz, or .net. Assuming you would register DataBoySoftware.biz because the dot-com address is already taken, your potential visitor has just been directed to your competitor's site. Add to that the simple fact that people are just plain used to dot-com names. If you have a dot-biz name, I can guarantee you that many people will type in .com instinctively when they type your domain into their web browser, or, when recommending your great web site to a friend or associate will state it as yourname.com rather than yourname.biz, without even thinking about it. Worse yet, if you have e-mail (which you should) at yourname.biz, someone at yourname.com is going to receive some of those important e-mails meant for you. Unless your are a non-profit (for which a dot-org name is usually expected), or have some important reason for using another extension, get a dot-com name. Even of you do use another extension, it is wise to find a name with a dot-com available, and register that name also. You can then redirect that dot-com address to your dot-org or other address, so that, when someone enters yourname.com into their browser, they will end up at your dot-other address. There are pros and cons to using hyphens in your domain name. In my opinion, the cons far outweigh the pros. One of the advantages to using hyphens is that a search engine will treat each word as a separate keyword, thus improving your search engine ranking tremendously. For example, if you sell sterling gold jewelry, and your domain name is sterling-gold-jewelry.com, you will place much higher in a search engine result listing than if your name was sterlinggoldjewelry.com. The reason for this is that the search engine will treat each word in the hyphenated phrase as a keyword. This technique is commonly used by affiliate marketers, who have no content on their site other than a list of links pertaining (or somewhat pertaining) to the keywords you entered for your search. These types of link sites are steadily growing, and frowned upon by search engines. It is rumored that some search engines have started ranking hyphenated domains names lower because of this practice. Hyphenated domain names also make your domain name easier to read - especially if your domain name is something like we-buy-old-cars.com. Great! Much easier to read than webuyoldcars.com, and much less prone to misspelling. Be sure, when you relay your domain name to someone over the phone that you spell it out for them, or say something like "it's we buy old cars dot come, with a dash between each word - not an underline, or a slash, but a dash - you know - like a minus sign", and make sure to tell all your customers that, when they recommend your site to a friend, they explain it that way so that there won't be any misunderstandings. Oh...and, as a precaution, make sure you can register webuyoldcars.com just in case. Better yet, just forget the hyphens and save yourself the headache. You can fudge a little on this one - depending on the name you are using. If you have a known company name, by all means, use it if you can. The domain name pugetsoundhelpwanted.com comes to mind here. It comes to my mind because I live in the Puget Sound area, and the company has a strong advertising budget. Their radio ad writers have always made a point of mentioning the name several times in their radio spots and, though long, it fits well into my memory bank. Their market is local, so Puget Sound is a familiar term, and we all know what help wanted is. The name is descriptive, and leaves no question as to what the site is about. That said, I still have a problem with the name. It is prone to misspelling. Recently, a client with a fairly long domain name called me upset that her site was down. She had just paid for an online ad and, when she went to the site to view it, and clicked on the link to her web site, her browser produced a "not found" error. Thinking that there may be something wrong with the link, she copied the text and pasted it into her browser address bar, and still came up with the same error. Assured, at this point, that there was something wrong with her site, she contacted me to fix the problem. A quick observation found that the advertising webmaster had accidentally added an extra character - both in the text, as well as the underlying link code. I only noticed it right away because that is the first thing I check - always. It comes from experience. Aside from the fact that, in this case, the webmaster should have tested the link and found the problem before anyone else even noticed it, the example is evident of the need to avoid the possibility of spelling errors as much as possible. Of the top 100 most popular web sites, the longest name is NetworkAdvertising.org at 61 on the list, with 18 characters. Behind that is CreaticeCommons.org at 59, with 15 characters. Next to that is WashingtonPost.com at 90, with 14. Notice a trend here? I rest my case. One thing to notice here, though, is that these "long" names all consist of two easy-to-remember words. The final consideration on name length is how you are going to use it in print. If you do small display ads, you will want to make sure you don't have to use a tiny font just to get the entire name on one line. Of course, business cards, brochures, etc. also need to be considered. So we've established that the best domain names are short, non-hyphenated, easy to spell, and end with a .com extension. The next thing you want to consider is that your name should be easy to remember. As you think of your domain name, imagine hearing it on your car radio. Would you still remember it when you got home? Your company name should be the first consideration over all. If your company name is something like "Julie Lynn's Fine Art and Custom Jewelry", your name is obviously too long for a good domain name. You can, however, abbreviate the name in some way, such as JulieLynn.com or ArtAndJewel.com. If using your company name is not an option, and you don't have a clever, easy to remember idea (like Go or eBay or Google), try coming up with a name that will identify your company's products or services. You might create a name around your most popular item or service. For instance, if you are selling musical instruments, try GuitarsAndAmps.com or PopMusicGear.com. Keep in mind your target audience. The goal is to have your name express the strongest association with the concept you promote. Also keep in mind that it is helpful to use a name that is high in the alphabet. Many search directories simply list links to sites in alphabetical order. You can't go wrong if your name is short, easy to remember and say over the telephone, and, in some way, describes your product or service. Don't allow a mistype or name misunderstanding to direct your potential visitor to a competitor's site. If you've registered, for example, SureFeet.com, check to see if the name SureFeat.com has been registered. If it has been registered, you might want to reconsider the name. If it hasn't, register it. Name registration is cheap, and you can have several sites pointing to your main site, so that, if someone types SureFeat.com into their browser, they will still end up at SureFeet.com. Avoid using plurals, if possible. If your name contains a plural, such as "gifts" or "tools", think about also registering the name that contains the singular of the word. Another reason for registering multiple domains is describing various products or services. For example, if your site is ProduceMart.com, you might also register names that contain different types of produce. Searching for a good, available domain name can be a project that taxes your time and creativity. Take the time. It will be worth it. If, after a lot of searching, you still haven't found the "right" name, walk away and attack it again later. Think about it while you are doing other things, and write prospective names down so you can try them when you are at the computer. There are web sites that will help you come up with a name or provide you with lists of expired domains for free or a small fee. You can do a keyword search of expired domains at Moonsy.com, or try the Name Spinner at LeanDomainSearch.com. As a final helpful hint, notice that I have been capitalizing the individual words in a combined-word name. Domain names are not case-sensitive (although file names and directories that come after the slash mark are.) This means that you can capitalize those words, for better readability, when displaying your domain name in advertising, promotions, and web site links. DataBoy is a Full Service company, offering Web Design, SEO, Hosting and Domain Name Registration, as well as Web Programming and Consultation.